Dang! Them Orford boys have done it again! 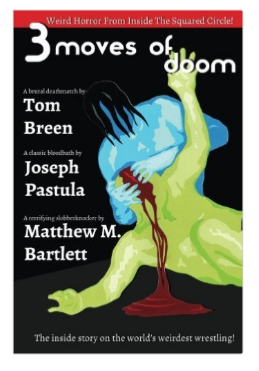 Folks, you aren’t going to believe it, but Orford Parish Books has served up another tasty treat: this chapbook includes three tales of weird horror set amidst the blood-soaked art form of professional wrestling. Matthew M. Bartlett, author of “Gateways to Abomination,” “Creeping Waves,” and “Rangel,” which is included in this year’s “Year’s Best Weird Fiction,” opens up the bleeding with “The Dark Match,” a tale of mortal dread and surreal woe set in the dingy wrestling venue of a seaside town. Joseph Pastula applies the submission hold of “A Severance of Roots,” a cautionary tale to collectors of all stripes about what happens when you find what you’re looking for, in this case the story of a dimly remembered wrestler famed for brutality. And Tom Breen gets the sneaky roll-up with “The Vision of James Lee Dawson, King of the Deathmatches,” which is a glimpse at what might happen if a thumbtacks and barbed wire match were the venue for theodicy. Plus: fun interior art! Easter eggs! Not literal ones, like, little jokes inserted in interstitial content. Look, just buy the book. Just this past week, we received notice that our own Joe Pastula’s “Midnight in the Desert” has been accepted for publication in “Turn To Ash Vol. 2: Open Lines,” and our Tom Breen’s collaboration with Matthew M. Bartlett, “The Long-Lost Parent,” has been accepted for an upcoming issue of STRANGE AEONS Magazine. Put that in your pipe and smoke it, haters!